One of the goals of exoplanet research is finding planets with the ability to harbor life. Although humans have found many exoplanets, none of them support life like that on Earth. Of course, there is a possibility that an entirely different form of life exists within the universe. However, we may be getting ahead of ourselves when thinking about what types of life exist. For one, we need to think about the conditions that make life possible on Earth. However, we have to be careful, “habitable planet” does not mean the planet has life, but that the planet has the necessary surface water to support life. It is generally thought that if a planet is closer to its host star than the boundary of the habitable zone, the location is too hot, which causes any existing water to evaporate. Outside of this boundary, it is too cold, which causes liquid water to freeze. However, in reality, the boundary location is much more complex. First of all, inside the habitable zone boundary, the “runaway greenhouse effect” occurs. On Earth, there is a balance between the sun’s energy that enters the atmosphere and the energy that is expelled. The Earth’s temperature is determined by this balance. In other words, if the energy that enters Earth’s atmosphere from the sun increases in any way, the Earth’s average temperature will rise. This is because more energy is being emitted, in order to keep this energy balanced. Nevertheless, on planets that contain surface water, there is a limit to the amount of energy that the planet can emit from its surface. Therefore, in cases where the energy entering the atmosphere exceeds this limit, the temperature will increase, thus, the energy balance can not be maintained. In other words, the planet is always accumulating extra energy. For example, if you paid only 100,000 dollars every month, but you are charged 110,000 dollars, every month you would accumulate 10,000 dollars more debt. In the same way, the planet’s temperature will rise infinitely, and with this temperature increase, the surface water will continue to be lost. 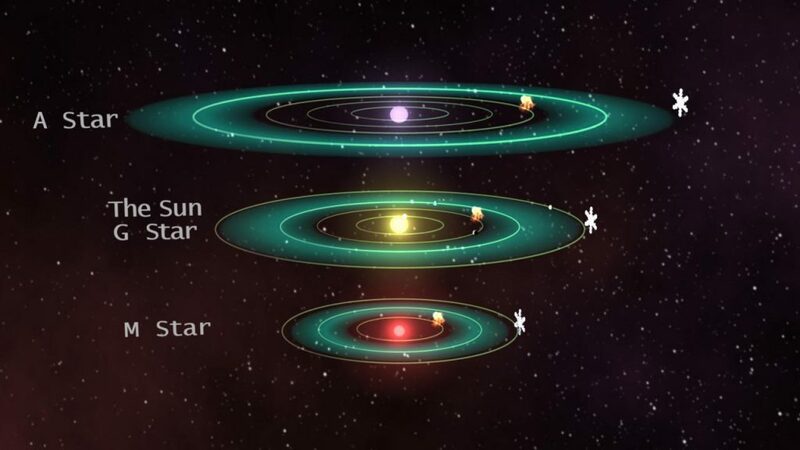 Closer planets receive a greater amount energy from their host star than planets farther away. The location just closer to the host star than the habitable zone is where the “runaway greenhouse effect” occurs. Even if a planet has a comparable to equivalent Earth, but it has no greenhouse gases, the temperature will be too low, and the surface water on this planet will be completely frozen. Therefore, when the outer boundary of the habitable zone is decided, the effect of greenhouse gas is taken into consideration. Recently, carbon dioxide has become the most important greenhouse gas on the earth. When a planet has a similar atmosphere to that of Earth and the carbon dioxide completely freezes due to the planet’s location, the greenhouse effect is lost, and the planet is considered outside of the habitable zone. Once a planet crosses this boundary, a weak greenhouse effect means the planet’s temperature will decrease drastically and all water will completely freeze. The planet becomes a “snowball earth”. We must be careful, however, when deciding if a planet is outside of the habitable zone. Generally planets with an Earth-like atmosphere are implicitly hypothesized to be habitable. But, if the amount of carbon dioxide differs, or if a planet has different greenhouse gas, the location of that boundary can differ as well. In other words, the outer boundary of the habitable zone can change based on the amount and composition of the planet’s atmosphere. *1 Unlike Jupiter’s moon, Europa, the surface is covered in ice over an ocean (interior ocean), where life is anticipated to exist. Also, like Saturn’s moon Titan, instead of water, the surface is covered in liquid methane, which makes it controversial when it comes to the topic of the possibility of life. However, if we are talking about about life like we have on Earth, then surface water is the most important requirement.